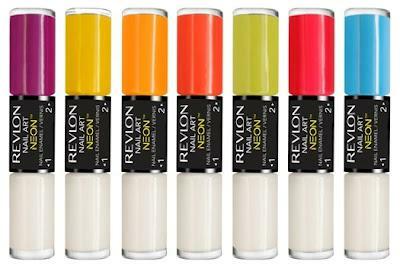 Since it's illegal to produce neon nail polish in the United States (they're imported if you spot some in store), Revlon came up with a clever idea with their upcoming nail polish collection, which will launch in July. The Revlon Nail Art Neons Collection ($7.99 for each) will feature shades, such as Fuchsia Shock, Ultra Violet, Groovy Green, Electric Blue, Neon Light, High Voltage, and Hot Hue. What makes this nail polish line legal in the U.S. is that the shades are actually sheer. However, when you apply two coats of the white base coat (featured on the bottom), they turn into a bright and beautiful shade of neon!